Utilizing a Rawlings 460 Electric Stationary Wood Grinder and the state of the art in-vessel composting tunnels, Whistler Composting helps move the Whistler community towards its goal of zero waste. Rawlings designed this complete wood waste processing system complete with a belt in feed and out feed conveyor, metal detector , Rawlings HZX Horizontal grinder, overhead self cleaning magnet and electrical control panel. The in-vessel system processes complex feed stock, while addressing concerns of odor generation and leachate. The system relies on fully enclosed flow through tunnels to transform organic wastes into a fine soil-like material over a 14-day period. By controlling oxygen, moisture and temperature, the in-vessel system provides control over the decomposition of organic matter that exceeds all standards set for composting facilities in North America, the United Kingdom and Europe. Compact, fully enclosed and modular in design, the system is not affected by the weather. 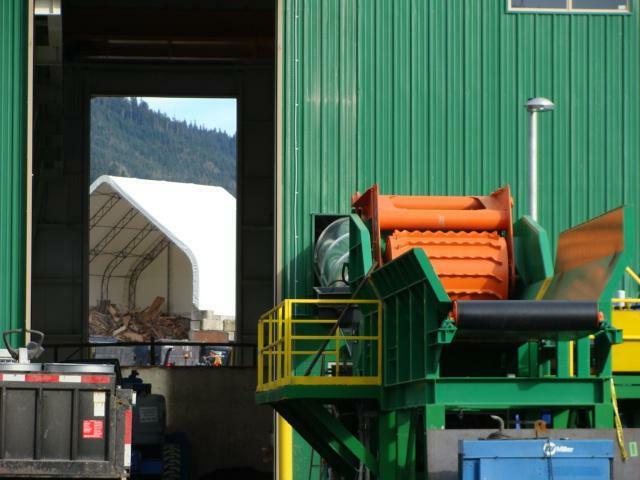 Rawlings Wood Hogs offers a complete line of wood waste processing equipment for helping mills in the sawmill and plywood industries convert their wood residuals into valuable wood fiber products. Available in a full range of sizes and models. Stationary, portable, diesel and electric powered units and by adding a wide variety of available options, and you’ve got the flexibility to customize the perfect wood recovery system .